This is my second scone recipe. I don’t know why I don’t make them often enough. Maybe just the mental block that they are difficult to make. Trust me they are not. There are two reasons I came up with recipe. Firstly, my partner for Shhh Cooking Secretly, Jolly who has a wonderful blog Homemade Recipes gave me the ingredients condensed milk and plain flour(maida, all purpose flour) for our July theme#MonsoonTreats. Monsoon means hot treats like bhajias, soups, curries. I really couldn’t think what Monsoon treat to make using those ingredients.I narrowed it down to baking something but what was the question. Coming to my second reason.. my brother, bhabhi and niece are here in Mombasa. They’ve come to attend a wedding. They were going to stop by for breakfast before going to the beach resort where the wedding is. I was suppose to bake a bread to serve for breakfast but didn’t manage that. Before going to bed was thinking what I should make when the idea struck… why not make scones? They bake within 10-12 minutes, don’t require me to leave butter at room temperature and still had to prepare my post for shhh cooking secretly. Next morning,dug out my basic scone recipe and made Dulce de leche and chocolate chip scones. They turned out amazing. Served them for breakfast and hubby had them for tea. Felt pleased as hot tea and warm scones is a sweet delicious Monsoon Treat. What is Dulce de leche? It looks like caramel but is actually sweetened milk that’s heated for a long period of time.The name dulce de leche (dool say day layche) in Spanish means sweet of milk or milk candy or milk jam.This mixture is very popular in South America, used in desserts, cakes, cookies, drizzled over pancakes or fruits.Most supermarkets in the Western World stock ready made dulce de leche. However, we don’t get it here so I make it at home. Its pretty easy to make it at home.Check the recipe below. Lightly beat milk, dulce de leche, egg and vanilla extract together. Mix flour, sugar, salt and baking powder in a big bowl. Add butter and using your finger tips, rub the butter into the flour till it resembles like bread crumbs. Add the liquid mixture and press the dough together. Very lightly flour a worktop and knead the dough just enough to bring it together. Roll it out into a circle. It should be 1″ thick. Cut into 8 wedges using a sharp knife or pizza cutter. Place the wedges on the baking tray. Bake for 10-12 minutes till the edges are brown. Remove the scones from the oven and let them cool slightly. Prepare the topping by mixing dulce de leche and cocoa powder. 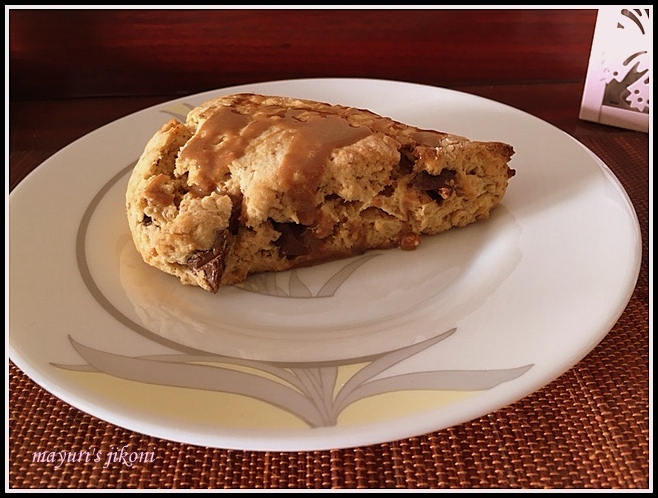 Drizzle the dulce de leche mixture over the scones and serve. Serve the scones with butter, whipped cream or jam. Take a sweetened condensed milk tin. Do not open it. Place it a saucepan filled with water, the tin should be immersed in it completely and bring it to a boil. When the water boils lower the heat and let the tine simmer for 1½ – 2 hours. Make sure you top it up with hot water if the water get evaporated. Remove the tin from the water and let it cool before opening it. The other method is place the tin in a pressure cooker. Add water. Let it cook for 8-10 whistles. Make sure the butter is chilled. Rub butter into the flour using your fingertips. Add raisins or other dried fruits or nuts instead of chocolate chips. Don’t over bake the scones otherwise they will become hard like biscuits. This is the ultimate comfort food – anything with chocolate chips is good with me!